LA JOLLA–(October 30, 2018) Clodagh O'Shea, a professor in Salk's Molecular and Cell Biology Laboratory and a Howard Hughes Medical Institute Faculty Scholar, has been selected as a recipient of The Paul G. Allen Frontiers Group's Allen Distinguished Investigator (ADI) program. She will be awarded $1.5 million over three years to conduct research into how DNA and its associated proteins (known collectively as chromatin) are packaged in the nucleus of cells. The work has implications for better understanding not only a range of diseases but also the fundamentals of human biology. 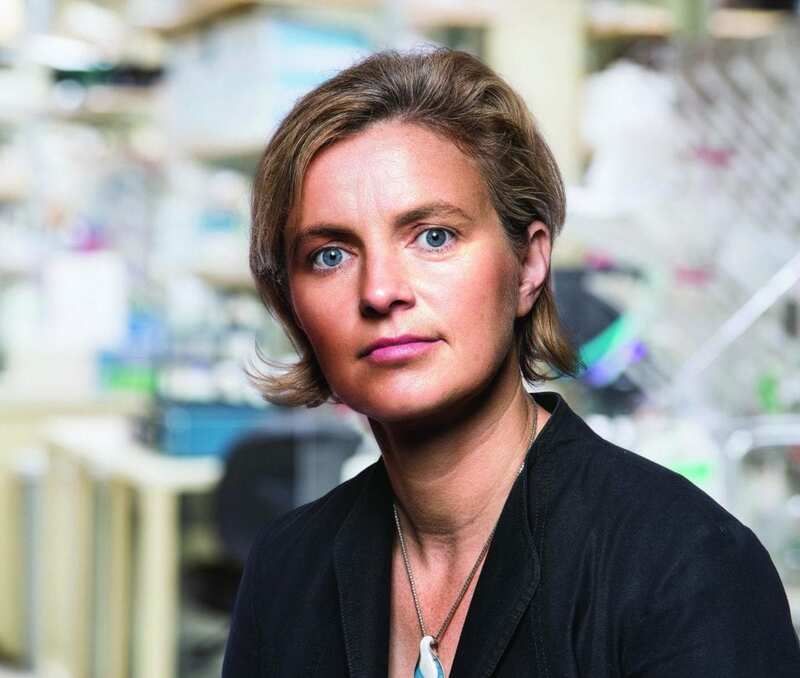 "Clodagh's research into chromatin is causing biologists to rethink a longstanding paradigm about how the genome is organized," says Salk President Rusty Gage. "Her development of a powerful new technology to visualize chromatin's 3D structure in living cells launches what promises to be a revolutionary new way to understand DNA. We are thrilled to have her exciting and groundbreaking work supported by The Paul G. Allen Frontiers Group." Human DNA in a single cell is about 6 feet long and is wrapped around proteins into flexible and intricate polymer packages–chromatin–that enable it to be compacted into the cell nucleus (.001 mm). Although the human genome has been decoded, the chromatin structure and 3D organization of our DNA and genes in nuclear space and time is still a mystery. Increasingly, scientists have strived to understand this packaging and how individual genes are accessed or stored away (silenced) in the cell nucleus. These processes are implicated in everything from healthy development to fighting off disease. O'Shea, who holds the Wicklow Capital Chair at Salk, is developing novel techniques to visualize the structure and function of chromatin in time and space. One innovation is ChromEM, which exploits a DNA dye that can be activated with light to undergo a complex series of chemical reactions that "paints" the surface of DNA with a metal. By combining ChromEM staining with an advanced form of electron microscopy tomography developed by Mark Ellisman's lab at UC San Diego (UCSD), the chromatin structure and 3D interactions of DNA can be reconstructed in intact cells and tissues. O'Shea will lead an interdisciplinary team of researchers at Salk and UCSD to test a new theory that, at critical concentrations in the nucleus, chromatin polymers change states between liquids and gels to determine gene activity and ultimately cell fate. When chromatin is dilute, it behaves like a liquid, enabling genes to be accessed and read. However, when chromatin exceeds a critical concentration threshold, chromatin chains form entangled gels that limit access to genes. O'Shea's team will determine if this simple biophysical principle underpins gene expression changes in normal and disease states. This new research frontier could reveal critical clues and groundbreaking therapies for preventing, diagnosing and treating diseases, such as cancer, premature aging and viral infection. The Allen Distinguished Investigator program began in 2010 to fund early-stage research that is less likely to receive support from traditional funding sources, but which has the potential to significantly advance our understanding of biology. Including the 9 awards given to 10 investigators in 2018, there have been 69 Allen Distinguished Investigators appointed since 2010.